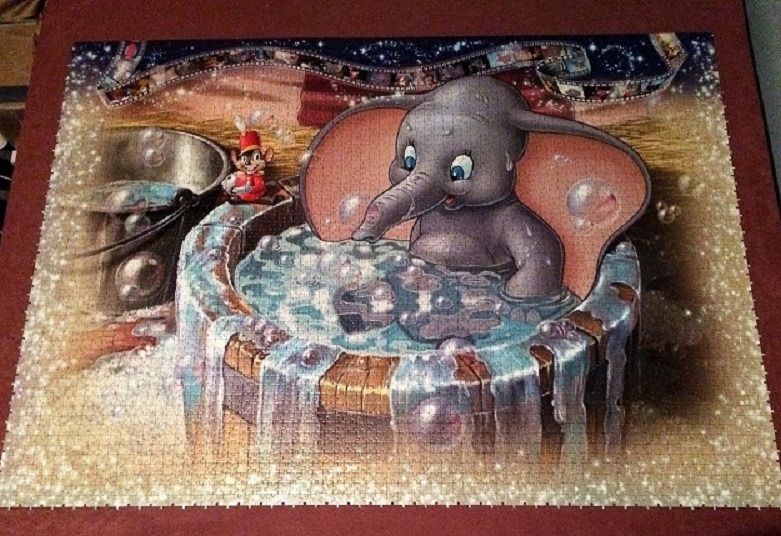 Dumbo was the third section of ten I completed, and going back over my daily updates on the blog I'm a little amazed at myself for working on the puzzle and posting about it every day. I sure was motivated! I chose Dumbo to assemble after Cinderella because he's just so darn cute, and I wanted something a little easier than dear old Cindy had been. I was a bit mistaken about the ease of this section's assembly, with basically only one character in the frame, that character was HUGE! 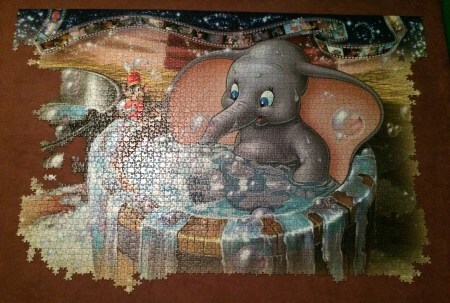 The number of pink and gray pieces for Dumbo was a bit overwhelming; but since sorting 4000 pieces is quite time consuming and this section had already been sorted I soldiered on and got to work. I started with Timothy Q. Mouse, his pieces were the easiest to find. Although he is the smallest part of this image he isn't small, he is about the size of one of my hands. As a part of the whole, though, he's pretty tiny. The small burgundy sections behind Dumbo were the next bit assembled, and because they attached to the filmstrip I decided to get that done early as well. Next came the straw and then the real work began, that giant, adorable elephant! The image above is after about 3 days of work; it doesn't seem like much does it? Those Disney animators sure knew how to draw "cuteness" didn't they? Every time I look at Dumbo it makes me smile, he's just so sweet! This is 3 more days of work, and everything is coming together very well. His ears are so big, I'm surprised at how much of the image they take up and how quickly I got them done. The bathtub and soap bubbles down the side were the next to be assembled, I remember being amazed at how many colors are in each bubble; there's blue, pink, white, purple, and sometimes even red. It's amazing how once they're all together it doesn't look like colors - it looks like a bubble! This whole section went pretty quickly, but the water in the tub and down the sides was a bit of a challenge. There were many shades of blue and gray and at times it felt a little tedious; many times I thought I was looking for one color and it turned out the piece I needed was a completely different shade. It kept me on my toes, that's for sure. And here he is - I completed this section in only 11 days! I learned a few things with this section that helped speed things up immensely, plus I think that I just liked this image so much that I was always wanting to work on it and watch it come together. I learned with Snow White that every piece in a section has a twin; with Cinderella I realized that every twin is in the same row. The sections are 72 pieces wide, so the 1st piece in the row and the 37th piece are twins! It finally clicked when I was assembling Dumbo that if I have most of a row completed I can count backward (or forward) to see the shape of the piece I'm looking for. This was so helpful working with the large sections of gray and pink! Instead of looking through 10 trays of gray pieces I could narrow it down to the shape I was looking for and only have to look through a few trays - brilliant! It sped up the assembly and made the entire puzzle feel a bit less overwhelming for me. 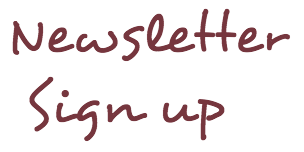 If you'd like to watch the entire section come together click here to go to the post on the first day of assembly and scroll down to click "next" to watch the daily progress. (I started adding a second post every other day of additional puzzles I've completed, so there are some fun and interesting puzzles to look at every third post). Peter Pan is next - stay tuned. 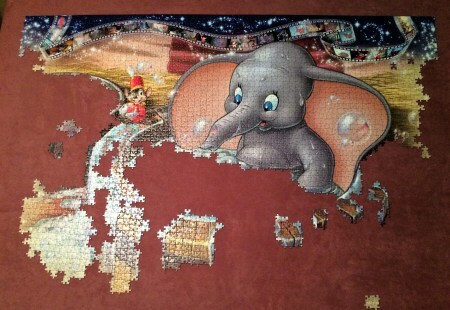 In my opinion, Peter Pan and the Darling children were the most difficult section in the whole puzzle!